I was under the impression that indoor water parks were for older (and taller) kids and a place we could only enjoy after the children were 10 or older 10. Boy was I wrong! 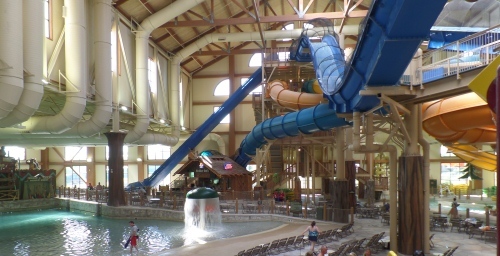 We recently took a trip to Great Wolf Lodge in Mason Ohio and quickly realized that children (and adults) of all ages could have a blast at the water park. As we approached the lodge, I was immediately amazed at the sheer size. It was huge! But despite the fact that it was completely booked full the night we were there, the water park never felt over crowded, we easily found chairs to place our towels and bag and the lines for the water slides weren't terribly long. The indoor water park was filled with a variety of slides. Our favorites included the Hydro Plunge that felt like a roller coaster, River Canyon Run where we could easily fit our family of four into the raft at the same time, and Totem Towers the two slides at the top of the tree house were we could “race” each other down to the bottom. Those are just the tip of the iceberg as there are 12 different water slides in the park, including 4 in Whooping Hollow an area perfect for toddlers. 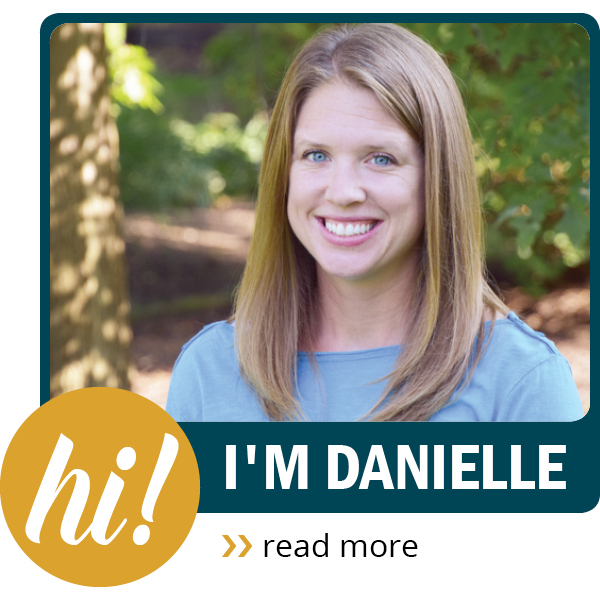 Of course, the water slides aren't the only attraction. We spent a lot of time exploring Fort Mackenzie and playing with the interactive water features that sprayed and dumped water in various directions. Both of our kids made it across the floating water logs in Chinook Cove activity pool (I appreciate the fact that parents were allowed to get in the water to offer assistance if needed). And we also experienced the excitement of patiently waiting for the huge bucket of water to fill up and dump 1,000 gallons of water down on top of us. 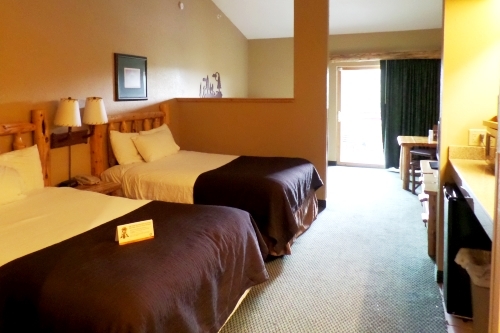 While at the lodge we stayed in the family suite which was well kept, contained a nice sized sofa and table separated from the sleeping area and a balcony with seating outside. Because I always bring along extra drinks and food when we are traveling I was happy to find a refrigerator n our room. Bringing along snacks is a great way to cut down on the cost of food while you are away from home. Be sure to pack some microwave popcorn for a late night treat. 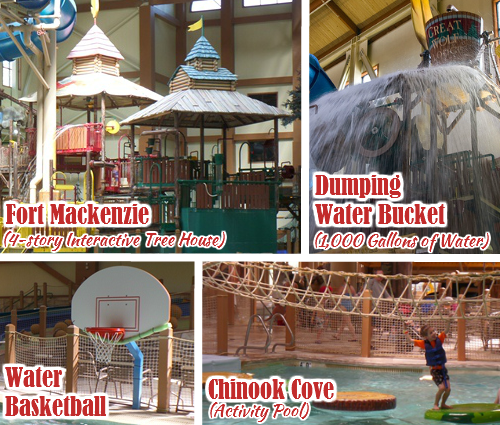 As if the water park itself wasn't fun enough, Great Wolf Lodge offers a variety of other activities to keep the kids and adults entertained. Overall, we had a wonderful time at the water park. It was such a memorable experience and was a fantastic weekend trip that allowed us to unwind, laugh and spend some much needed quality time together as a family. 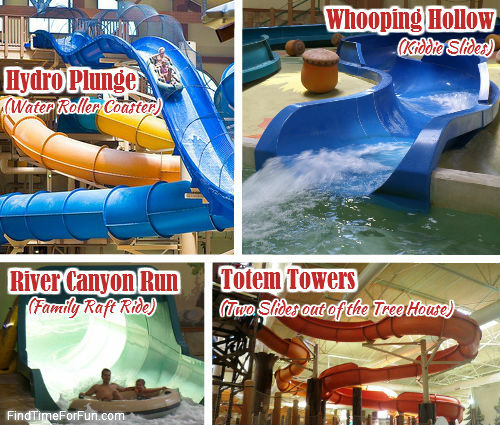 And now that we know that indoor water parks have options for kids of all ages, we can't wait to go again! 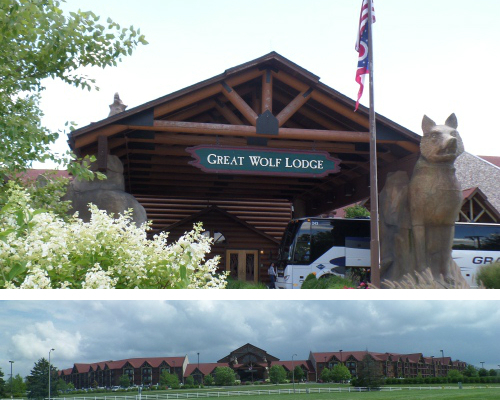 Have you ever been to Great Wolf Lodge? If so, which one of the water slides (or other water activities) was your favorite?